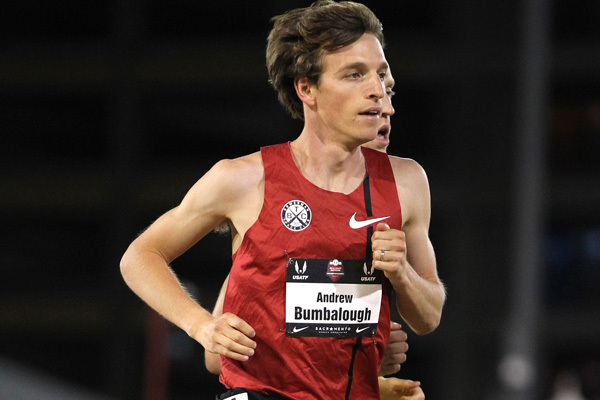 On November 26, Andrew Bumbalough ran 28:09.35 for 10,000 meters, less than 13 seconds off his personal best, at the Hachioji Long Distance meet in Tokyo, Japan. A late-in-the-year near-PR on the track is notable for pretty much anyone, but for Andrew, who’d spent much of the previous year and a half injured, the performance was even more remarkable. It also gives him a huge confidence boost as he eyes his debut marathon in 2017. “I was really pleased with the way it went,” Andrew says about his first track race in two years. “I thought 28:00 was possible on a good day, and I felt really good through a little past halfway. My lack of complete fitness caught up with me the last two miles, especially once they picked up the pace.” The race was won by Kenya’s Ronald Kwemoi, the world junior record holder at 1500 meters, in 27:33.94. “Just the fact that I’m talking about being near my PR after such a long layoff is really exciting,” Andrew says. Andrew’s year-plus injury woes started, as they sometimes do, at another time when he was in great shape. In March 2015, he ran a PR of 1:02:04 at the NYC Half Marathon to place fifth overall and first American. The race was intended to be the first step in a slow build-up to the 2016 U.S. Olympic Marathon Trials last February. Instead, once he started his transition to training for outdoor track, he was bothered by what was ultimately diagnosed as a sports hernia. In July 2015, he had surgery to repair the small tear that extended from his lower abdomen to his upper thigh. He didn’t run for three months. When Andrew resumed training, it was time to start gearing up for 2016. “If it had been any other year but an Olympic year, I would have taken a slower approach coming back,” he says. Rushing his comeback while not yet feeling like his old self mechanically led to a sacral stress fracture. “By late spring it was obvious I wouldn’t be running the Olympic Trials, so I decided to stop and get healthy,” Andrew says. He began running again in July, and did only easy running his first two months back. With September came the addition of workouts and the obligatory rust-buster race, an 11th-place, 14:18 performance at the national 5K championships in Providence, Rhode Island, on September 18. “I wanted to get out there and race, but I knew I wasn’t fit enough to mix it up with those guys,” he says of runners like winner Ryan Hill (13:57) and U.S. Olympians Shadrack Kipchirchir, Leonard Korir and Donn Cabral. Andrew’s progress continued two weeks later with a 48:13, 8th-place finish at the national 10-mile championships in Minnesota. The site of Andrew’s debut has yet to be announced. Regardless of the locale, when the only person ever to make Chris Solinsky vomit after a workout is healthy and eager, as Andrew now is, it will be a race worth watching.